At this time of year, the amount of debris affecting the exterior of commercial building is much greater than any other time of year. With stormy weather blowing leaves, branches and dirt into gutters and down pipes, winter is a great time to schedule annual building maintenance. This is exactly what our clients at Christian Health Care do for each of their sites. It always amazes us at just how much the outdoor environment impacts a commercial building over the space of a year. From bird droppings to moss, a building’s exterior can look quite different from one year to another – so it’s important to do annual building maintenance. Recently Christian Health Care was due for its annual building maintenance. For each site we were requested to get the building exteriors looking as good as new. 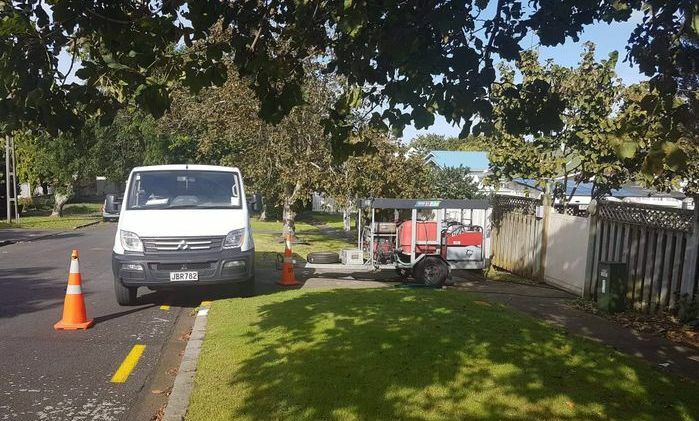 Every year our team carry out building maintenance on all Christian Health Care Sites from Amberlea in the North to Waiuku in the South. Although we inspect the premises annually, every year comes with a new set of issues. The amount of build-up largely depends on a number of variables. This year we dealt with moss and lichen build-up on roofs, pathways, stairways, outdoor furniture and exterior walls. There was also a huge build-up of leaves, branches and debris in gutters, down pipes and furniture. It seemed like the spiders and birds particularly liked visiting the premises over the last year as there were spider webs and bird droppings site wide! But we love a challenge and quickly came up with a plan to restore each site’s exterior. 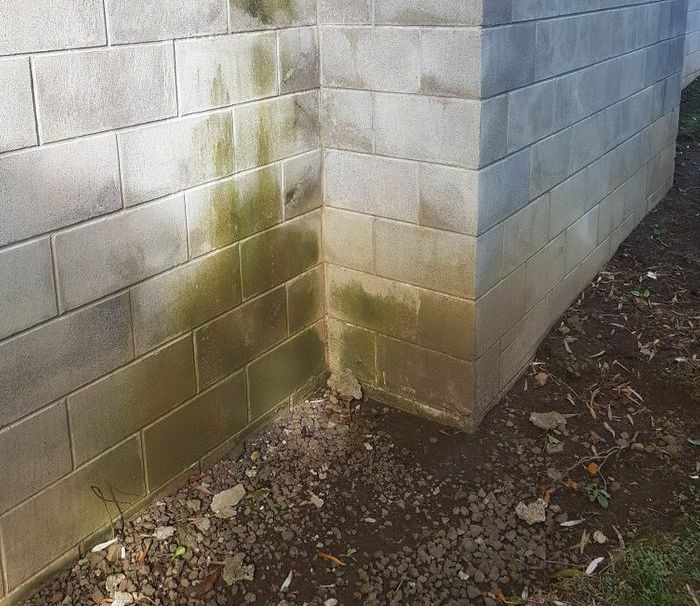 The most efficient way to get rid of the moss, lichen, bird droppings, dirt and grime was with a Whirl Away. A Whirl Away is a machine that we use to give concrete flooring a deep clean. Its 5,000 PSI swivel rotary and three nozzles can break through even the toughest stains and oil marks. We water-blasted the exterior walls, canopies, spouting, gates and fences using long-pole guns and adjustable guns. The water-blaster also dealt with any spider webs and residual dirt and grime build-up that wasn’t removed by the Whirl Away. Each of the tenant’s rooms on the site were cleared of debris in their outdoor furniture and door frames. The roofing at each of Christian Health Care’s premises were also thoroughly cleaned. This included all gutters, down pipes and roofs. We treated moss using our moss trailer which can hold up to 400 litres of water and 1,500 PSI. This is a soft wash application used specifically for roofing so it does not damage tiles. 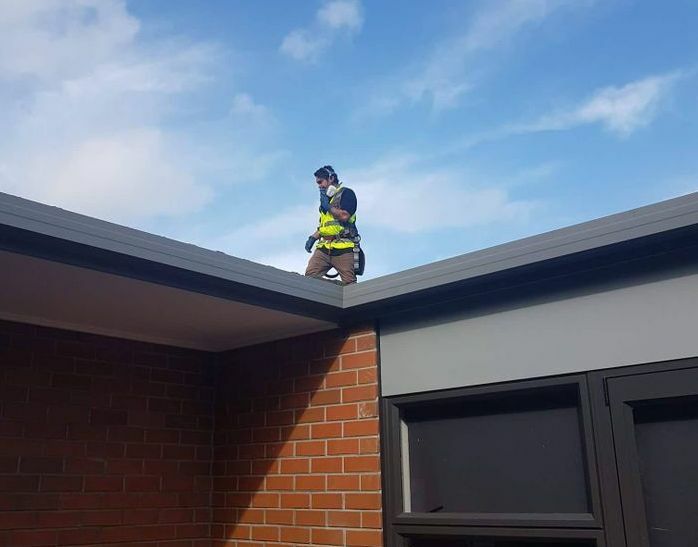 Safety is the utmost important thing on every job and, when cleaning roofs, our team are connected to harnesses and lanyards at all times. Only those with the right permits, certifications and safety gear can access the roof, and only those with an ATW (Authority to Work) can access the site. When we enter Christian Health Care’s premises, care is taken to ensure we close all the gates as we pass through. Although time consuming, this ensures the safety of our client’s patients and our team. When our clients are happy, so are we. Christian Health Care is once again thrilled with the building maintenance we completed on their premises this year. 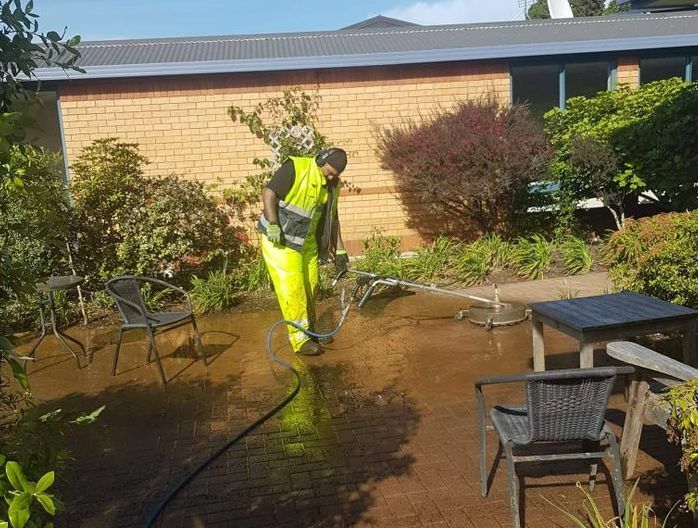 Thanks to the efforts of our team, the patients at Christian Health Care can now enjoy their outdoor areas and furniture without having to deal with spiders, bird-droppings and various debris. Performing building maintenance means the full exterior of all a commercial building is left in a clean, vibrant and more inviting state. If you think your building is in need of a little TLC, call us today. As we plod our way through winter, it’s a great time to get your building in tip-top shape for the Spring/Summer season.